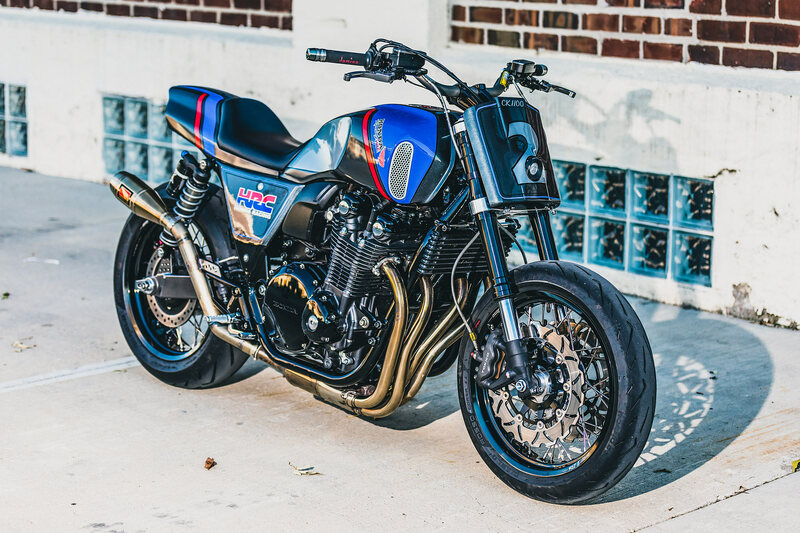 “I parked the bike in front of the entrance of our Austin hotel as I ran upstairs to clean up,” says Chris Kent, the mastermind behind this, the ‘CK1100’ Honda racer. When I returned, the hotel manager approached me smiling and let me know that I had ‘just missed it’. ‘Missed what?’ I asked. He proceeded to tell me that the HRC MotoGP team just came back from the track and had seen my bike. They piled out of the van and proceeded to snap some photos with it – Marc Marquez included. 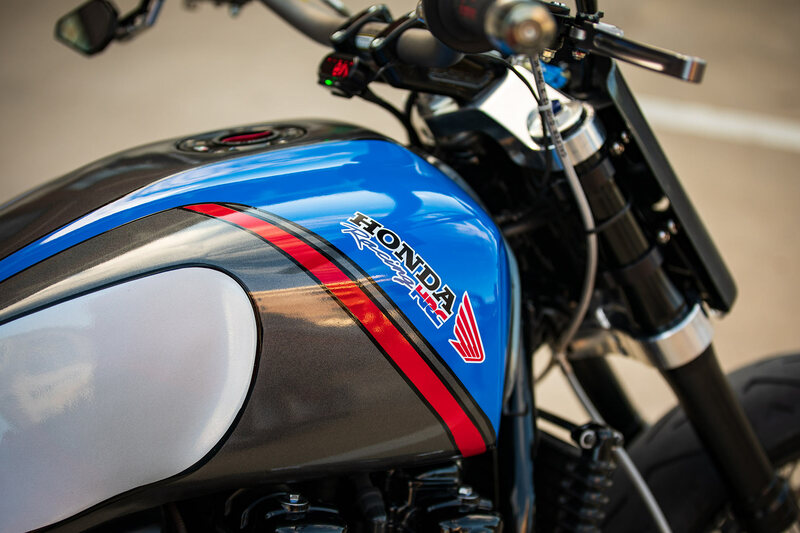 I had missed them by only 3 or 4 minutes.” So just what does it take to stop Honda’s best in their tracks? This is what. Chris – an Iowa engineer and a Marc Marquez fan – works with local school friends at Smith Brother’s Classic Cycles & Customs in Cedar Rapids. 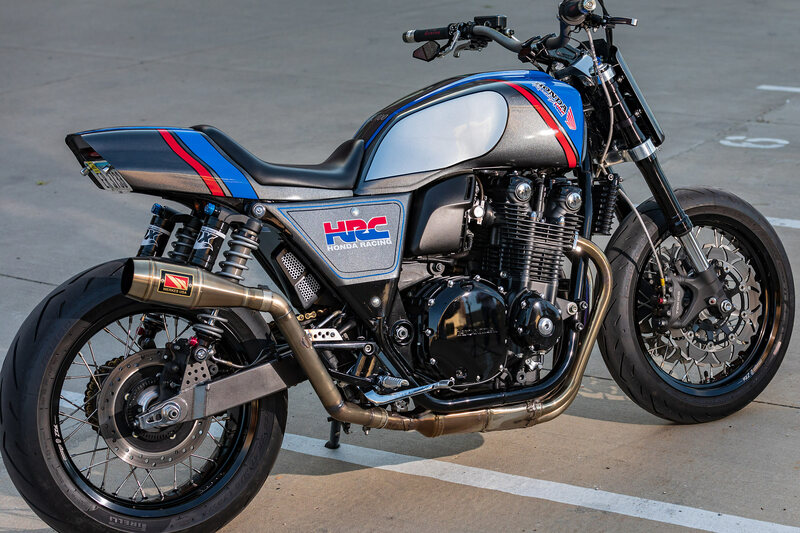 When they aren’t impressing the world’s fastest riders, their primary focus is on classic restoration and custom builds – mainly for 70’s and 80’s Japanese motorcycles. “We are currently restoring a ’67 CB450 Black Bomber and a very well-kept ’75 CB750. 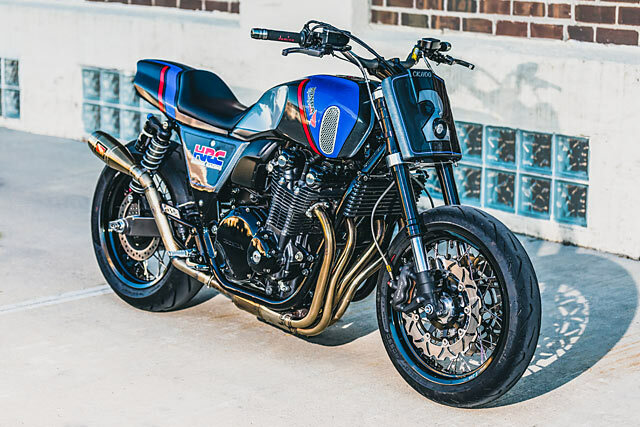 Our first custom build to get serious attention was the Obersten Regal ’79 CX500 that was invited to The Handbuilt Motorcycle Show in Texas where Marquez saw the bike.” Life’s funny like that, isn’t it? 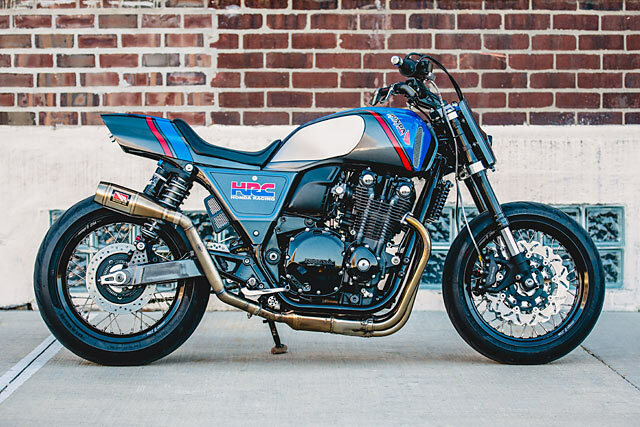 Chris tells us that the bike is ostensibly a Street Tracker that’s meant to be raced; be it on track, at Pikes Peak or on a quiet street, it’s clear that this ain’t no show pony. 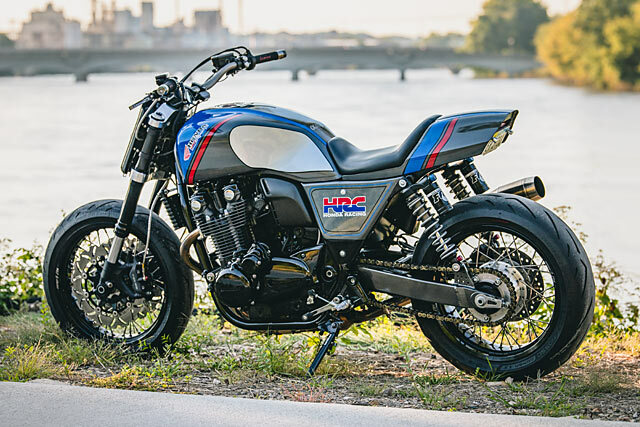 With a healthy boost in power thanks to some tasty mods, this previously sedate 2014 Honda CB1100 now has a little more bite in its bark. 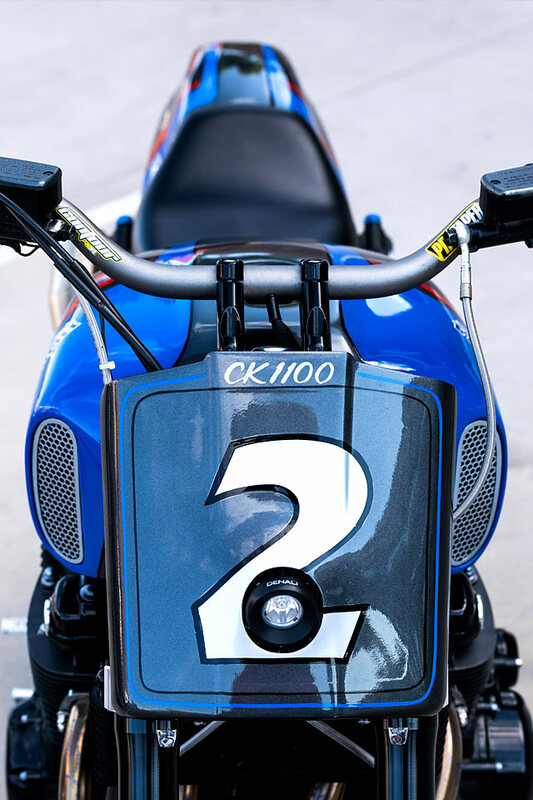 So the CB is now a ‘CK1100’ – the Colorado Climber with its sights set on Pikes Peak. 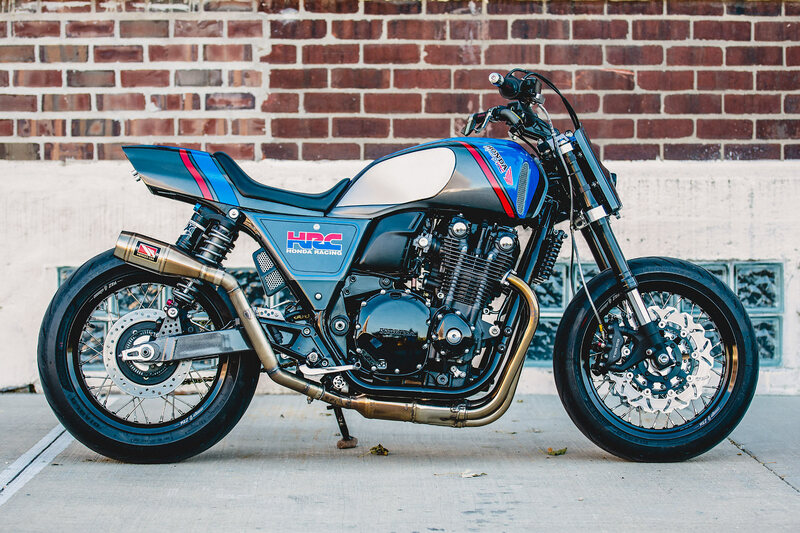 “I had originally been looking for a CB750 or CB900 and then I came across this CB1100 at a local Honda dealer,” continues Chris. They had it priced right and then one day they sent me an email with a discount that I couldn’t refuse.” So Chris did a little trade, the deal was done and the fun began in earnest. 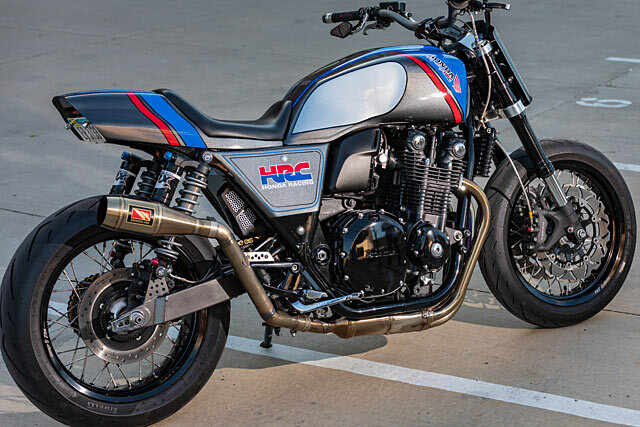 “I had seen the CB1000R concept bikes that were being kicked around from Honda in 2017 and I thought it would be possible to do something very cool with a CB1100. So I started working on some ideas and as most projects go, the design morphed as the concept moved into practical functionality.” How so? Note the functional air scoops on the fuel tank, for instance. They are there to force air down on top of the heads to help keep her cool. And boy, don’t they look cool as well? The team’s first big issue to solve was the electricals. Some of the newer factory ignitions won’t function properly once you start tearing everything off and the guys at the local Honda dealership couldn’t guarantee it would function properly. 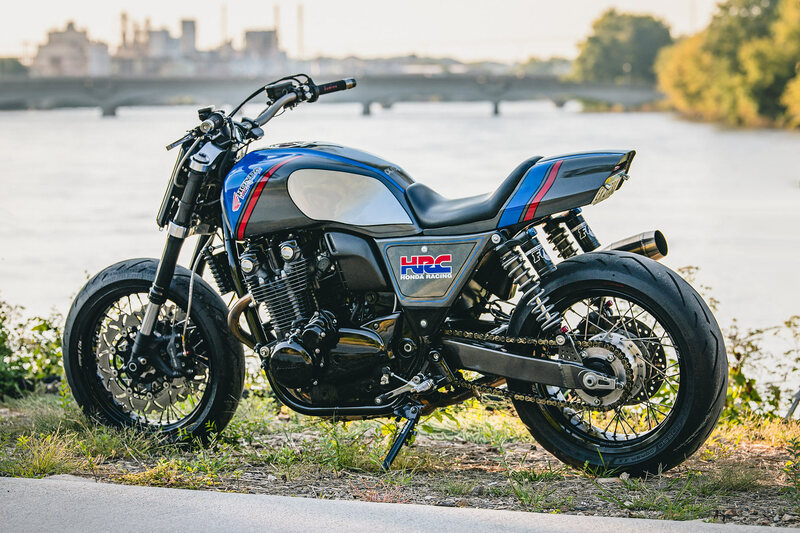 “The good news was one of their long-term techs had just recently accepted a job with Honda engineering and was spending every week in Colorado for the next 6 months in the company school. They gave me his contact information and I gave him a problem to solve with the instructors, which they happily did.” Fortunately for Chris and the Smiths, all the issues they had feared were quickly put to bed. “I knew we needed to swap out the suspension and I originally considered an Öhlins rear monoshock, but after further consideration I stuck with a dual shock set up. 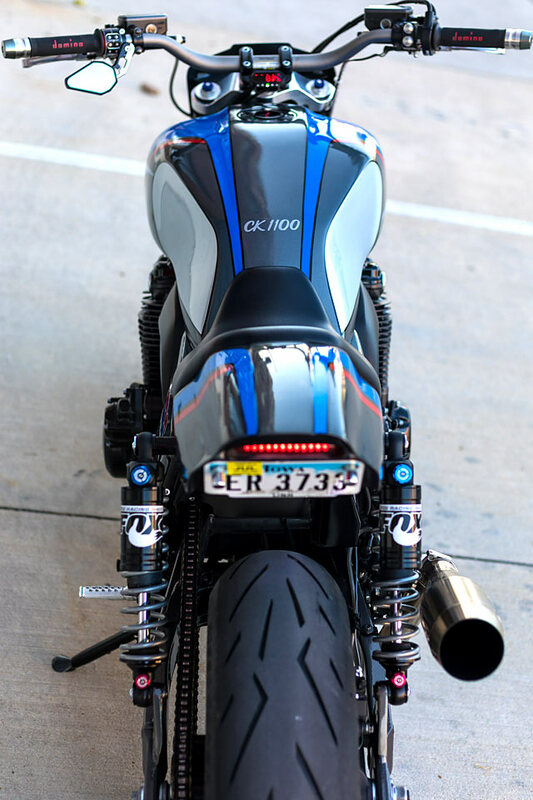 The front end is off a CBR1000RR, but we needed to get my friends at Cognito Moto to CNC some custom triple clamps and a stem to fit the CB1100 neck.” They also called in a favor at Fox Racing to get Chris the very last set of Fox RC1 Podium shocks in the area for the rear. And then they took quite a lot of swing arm modifications to fit correctly. 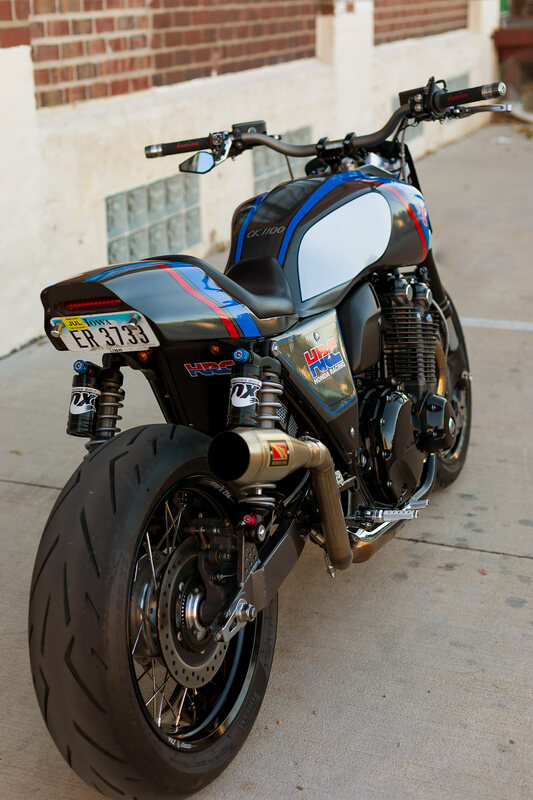 “The ride is probably my favourite part of the finished bike,” Chris smiles. 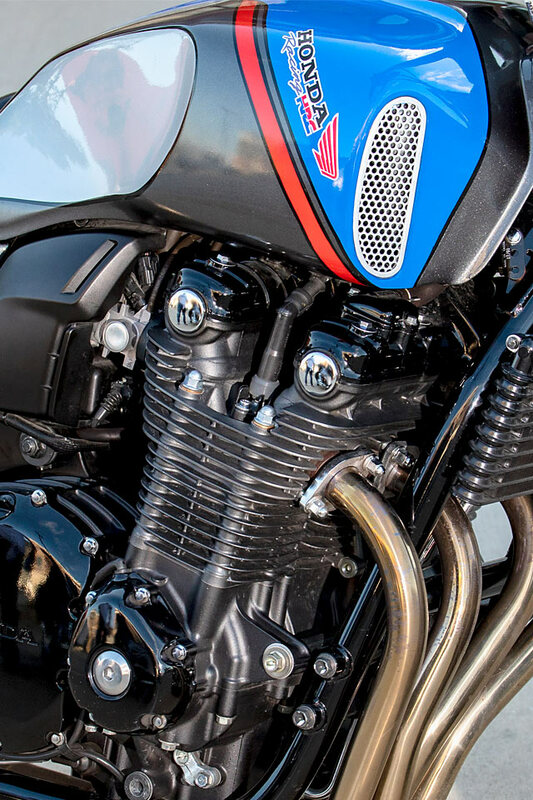 “I’ve dialed in the suspension and after making some significant gear changes, the bike is out of this world on some of Iowa’s rolling twisties. The lowered center of gravity and new seat position have you in an ideal riding position for the track or kicking around town. 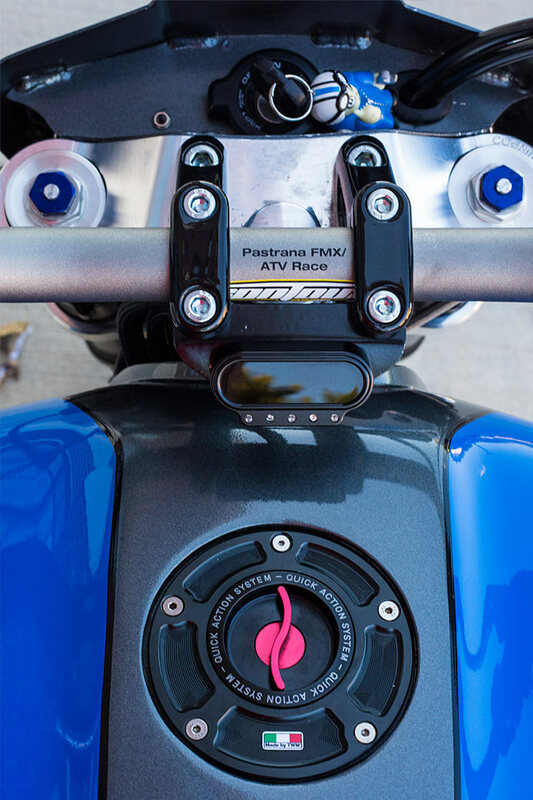 The wide Pro Taper bars, slant back risers and the weighted bar ends allow you to lean hard into the corners at the right angle while never feeling any hard front end dive.” Were pretty sure Marquez would say the same thing.